Picture the scene: the UK’s referendum on European Union membership looms, and polls have swung heavily in favour of leaving. Panic grips 10 Downing Street. Yet there may be another way. Breakingviews imagines how a senior adviser to Prime Minister David Cameron might suggest the unthinkable. It’s time to face facts: you are not going to win. Mark Carney, Christine Lagarde and Barack Obama’s interventions have not been enough to persuade the British people to vote to stay in: immigration scaremongering has trumped rational debate. Don’t worry, there is a way out. There is still time for you to postpone the referendum by at least three months. First, it would take a law in parliament. We have no hope of getting this through on our own, but with help from Labour it should pass. Jeremy Corbyn, as leader of the opposition, will demand you resign immediately after the referendum. You will agree. Second, go to Brussels, and explain to your fellow leaders that they have a choice between the EU falling apart, or agreeing to a reform of the free movement principle. That could involve some kind of cap on migrants: it will be messy but enough to defeat the argument that immigration is out of control and unlimited. Right now, that is your biggest problem. Fix it, and much British opposition to the EU will fall away. You will hear lots of guff from them about not violating the principle of free movement. Ignore it. Free movement is not set in stone. The treaty allows for limitations on the grounds of public policy. We would probably need to agree that any limit is not permanent, and does not discriminate against any nation, or undermine the central point. Besides, the legal issues are irrelevant. Your fellow leaders know that Brexit could tear the EU apart, or force them to commit to fiscal union, for which they have no domestic backing. And a breakup of the euro will be much messier for them than Brexit. Their careers may depend on giving you a deal. They may bleat about whether the European Court of Justice will back it. Piffle! It has sanctioned the euro zone’s bailouts and the European Central Bank’s pledge to buy euro zone government debt. It’s not like it would be the first time they’ve flouted orthodoxies to keep things from falling apart. It’s far better to do this now than wait until after the referendum. The people would have spoken, making a second referendum much harder. Other EU leaders would be angry and preoccupied with their own problems, and Boris Johnson, who as you know has designs on your job, would probably be leading discussions. The other leaders will find it easier to say yes to a broken man than a eurosceptic zealot. The cost, even if we succeed in postponing the vote, may well be your political career. It is over anyway. Take comfort from the fact that history will judge you as a patriot who placed his country above himself. George Osborne or Theresa May will probably win the election. You should thank them: they can try to clean up the deficit! 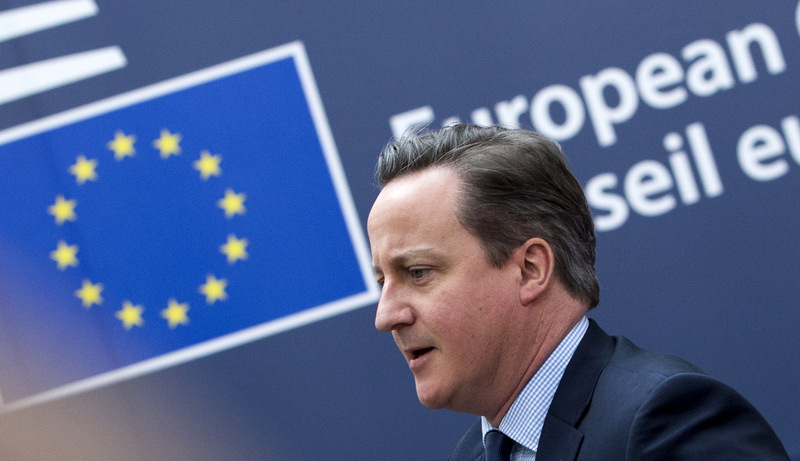 The UK will hold a referendum on June 23 to decide whether to stay in or leave the European Union. An online poll conducted by ORB for the Independent newspaper published on June 10 showed the Leave campaign winning by 10 percentage points, at 55 percent of those polled.